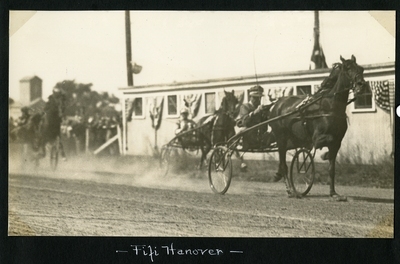 Black and white action photograph of bay mare Fifi Hanover trotting to a first place win in the Hahnel Bros Co. Race at the Maine State Fair in Lewiston, Maine on Monday, September 6, 1937. Bay mare Orena Hanover placed in second. Bay gelding Volunteer showed in third.